X-axis of the graph represents the serial ID of the article in the knowledge base. 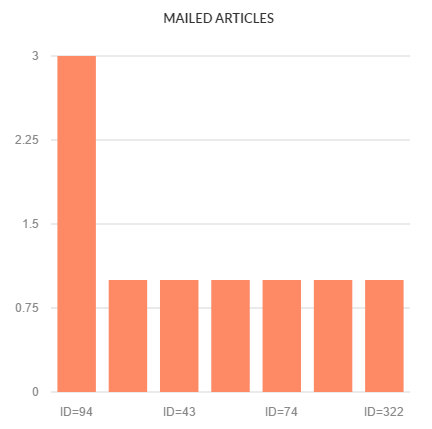 Y-axis of the graph represents the number of times article has been mailed to a friend. When you move the mouse pointer over the bar, it will display the ID and the total email count (number of times the article was mailed). ID: This column displays the serial ID of the article in the knowledge base. Title: This column displays the title of the article in the knowledge base. You can click on the title to view its details. # Mailed: This column displays the total email count i.e. the number of times users have emailed an article to their friends. The table shows the articles in descending order of their mail count. The most emailed article is shown at the top and the least emailed at the bottom.